The military used to be known for their legal discrimination in maintaining a strong and cohesive force. Discrimination used properly is a force multiplier, however bigotry cannot be tolerated as it is corrosive to good order and discipline. So who will judge the just or unjust authority figures? Merit promotion policies took root during the Johnson Administration, an offshoot of Americas Civil Rights. The social engineers in “the marketplace” started enforcing quotas for blacks and other minority groups, with the theory this would ensure Equal Opportunity, in the otherwise dominated white male workforce. Somehow this has morphed into “the white man is the oppressor” within progressive academic circles. Should not a man (or women) be judged on the “content of their character’, as coined by the Civil Rights greatest leader, Dr. Martin Luther King Jr.? Everyone I have ever known agrees with this assertion, yet regulating this principle within the “great society” of diverse humanity seems to have predominantly failed. Character Assassins within a Orwellian type of society, now seems to dominate the landscape instead of the ideals once envisioned. And a state of denial by politicians that regulating (White) society has been ineffective, even with over 50 years of accommodations, and a Black President only seems to have exacerbated the issues, and caused greater pain and resentments for all involved. The Bible, Sci Fi? And the World. 27 They did eat, they drank, they married wives, they were given in marriage, until the day that Noah entered into the ark, and the flood came and destroyed them all. 29 But the same day that Lot went out of Sodom it rained fire and brimstone from heaven and destroyed them all. Demonic forces have been at work in this world since the book of Genesis. Mankind has mixed with devils, built pyramids, done human sacrifices, all for the dark powers which came from the practices of abominations, in defiance of the Lord God of Israel. Satanic practices have been, and still are, the norm for a fallen world. Even if you don’t believe such practices exist, as they are done in darkness and hidden from sight. It was predominantly the Anglo who spread the Gospel of Jesus Christ to a fallen world on the mission fields, starting with the 11 Apostles commissioned by God to go forth into the worlds “planting fields” exclaiming the good news of Jesus Christ, crucified and resurrected for sin. Western civilizations were soon blessed of God, as they tried to honor Him. These antichrists are apostate brethren in other words. The first overbearing legalistic systematic world church system, was, of course, Rome under Constantine, with Peter, (who was martyred in Rome for his faith) said to be the first Pope. However, what Jesus Christ actually said was, upon this truth (that Christ was the son of God) I shall build “my” church. Naming Simon as the Rock or in Latin Petrus. Also, the scripture specifically condemns calling any man Father (as in God the Father) or Pope. Can you see the diversion away from the deeply personal, and spiritual connection to Christ and the Father? The rise of Papacy is indeed Antichrist by its very nature! The credentialing of the world has nothing what so ever, to do with the Gospel of Jesus Christ, and orchestrating it as an institution of man, is a form of rebellion, which the scripture equates with witchcraft! The underlying power of twisting the meaning of the scripture by false doctrines is Satan, the butcher of the brethren, the King of Babylon, and the mother of Harlots, within the false Church! Revelations Chapter 17. The Reformation (Protestantism) I believe, struck a mortal head wound to the antichrist universal world church system: Revelation 13:3 > And I saw one of his heads as it were wounded to death, and his deadly wound was healed: and all the world wondered after the beast. The beast being Satan, and the world following him, after the healing. This appears to be “Popery” again, the mother of abominations, drunk on the blood of the Saints. 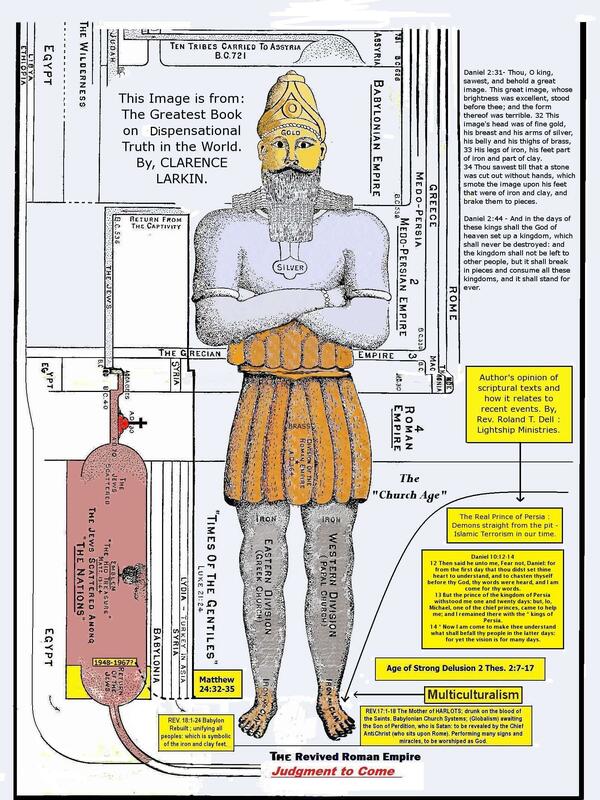 It is also the blending together of the world’s religions in creation, of a one world order, the feet of iron and clay as found in Daniel,(multiculturalism) which will be destroyed upon Christ’s return for Judgment, the destruction of Babylon the great! Daniel 12:4 > 4 but thou, O Daniel, shut up the words, and seal the book, even to the time of the end: many shall run to and fro and knowledge shall be increased. In the 1930’s within the United Sates, Eugenics became the modern equivalent of building a society devoid of God. The goal was to build a super race, and systematically destroy any people’s who did not live up to specifications of a perfected humanity. The NAZI’s were accredited with the horrors of perfecting this so-called science, but, in reality, this “new world order” was being practiced all around the world within communism and democracies as well. Most everyone knows of the correlation between the Occult and the attempted development of NAZI weapons, at least, to some degree. Admiral Richard E. Byrd, once attempted to explore a great opening, leading to the subterranean cities of the antarctic, and said to be tracking the last of the NAZI U-Boats, (returning advance technologies by some). Admiral Byrd was commissioned with an entire fleet of troop ships, and aircraft which was reportedly destroyed by flying disks, (which the NAZI’s had dabbled in an attempt to build, yet were unsuccessful – at least on the large-scale). The natural resources in this area of antarctic, which gets 100 below zero, were said by Admiral Byrd, to have had vast in minerals, and fuel deposits, which would last for centuries. It is my personal belief that UFO’s and aliens of another world, are demonic in nature, so I have cited the above Biblical history, in an effort to express an aspect, of the world powers in having an interest in the Satanic spiritual realm, to rule and reign. All secret societies that I am aware of, thrive on the dark powers of the demonic realm in one form or another. Jesus said that the LOVE of money was the root of all evil, and the world banks are no exception, nor any organization which derives its existence on the coins which belong to Caesar. All forms of witchcraft are based on the ultimate quest for power, and the highest form of elitists’ are cognizant of this fact. It is too easy to simply dismiss these accusations as hysteria, or conspiracy theories so to deflect away from the truth, of what is really taking place away from the light of the world. Margaret Sanger, a proponent of modern day eugenics, and birth control and worked with Planned Parenthood in preventing unwanted pregnancies. She did not like abortion, yet thought it was allowable in extreme cases. And although I have nothing against birth control personally, I do take issue with the eugenics, and the promotion of abortion for the undesirables. The justification for sterilization and abortion are not that far removed from what the NAZI Eugenics programs followed. However, the aliens are not alien at all; but rather those who still practice a type of high-level worship of Satan, with demonic practices for power and control of the world, and its people. In my estimation perhaps even human sacrifice, specifically offering babies, or even baby parts to Satan, and changing the spiritual atmosphere all around us, is perhaps probably still done – like with the children offered to Molech found in Leviticus 18:21 > And thou shalt not let any of thy seed pass through the fire to Molech, neither shalt thou profane the name of thy God: I am the LORD. These type of practices have been practiced since the days of Noah. Then God destroyed the earth the first time. Also, Pyramids and Ziggurats’ around the globe functioned in this manner early on, and supernatural powers which once may have existed even within the construction of these pagan temples, still defy logic even today. Science has become the god of this world now, and man has become too smart to believe in hybrid humans & devils, having Nephilim by the daughters of men. (Hebrew: נפלים, Nefilīm). Demons today may undoubtedly take on more acceptable forms in the physical realm such as extraterrestrials perhaps. Too incredible to keep on reading? Well, ok, but the science god of today, does allow for such ancient practices to continue in one form or another. 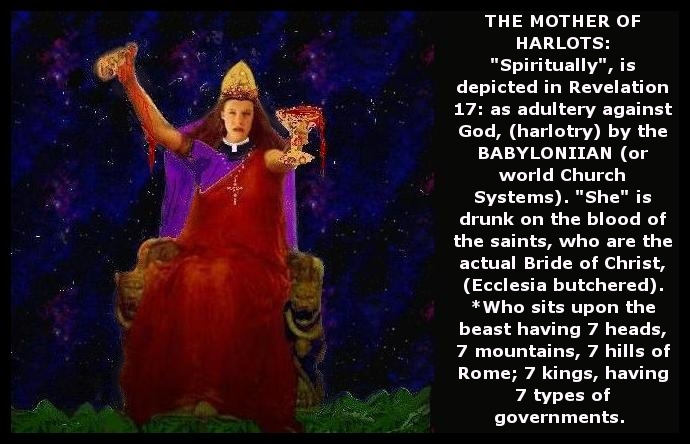 The “Man of Sin” Satan incarnate will be revealed most likely on the Seven Hills of Rome, by the “Mother of Harlots” who is the mother of systematic theologies about Jesus Christ, but not with him! This is the Chief antichrist (the Pope) who introduces Satan as God returned, performing many signs and miracles and worshiped as God upon the earth by Satan’s people (the wicked) who are not born again of spirit and of truth! This (Satanic) new world order probably already exists behind the scenes, with Satan lying low until the Lord God of Israel allows him to appear. The man of sin will be revealed 2 Thessalonians 2:3 > Let no man deceive you by any means: for that day shall not come, except there come a falling away first, and that man of sin be revealed, the son of perdition. The great falling away has indeed occurred, the camp of the Saints has been overrun by Paganism, even in the western cultures which once stood on Godly principles. Nationalism to my way of thinking, must die away first and be replaced by Globalism. Admittedly I could be wrong in my estimation, but logic and current events would dictate that I am not. It seems to me that industrialized nations, once dominant in western cultures, must now be overrun, and perhaps even the 05% of white westerners and Christendom of the world are being targeted towards destruction. Paganism once again runs rampant in civilized societies, and is imported into once sovereign lands by the thousands, in a humanitarian gesture towards everyone being equated, and blended together as one. And the Pope (the Chief Antichrist) promotes it. Did you know that according to Roman Catholic prophets, the present day Pope is predicted to be the last? Whereas God, in contrast, separated the people of the earth into different tungs, regions, and ethnic groups. The Gospel went out to all the world predominantly by the “white west”, and now “Satan’s people” apologizes to the world for the white man, in bringing his civilization to what was once called savages. Communism coupled with liberalism (producing humanism), seem to have been the vehicle allowed by God, and used by Satan, as the political vehicle against the Christian informed west. Not only do “the wicked whites” apologize, but they sell out their own ethnicity for the blending together of any people s or lifestyle, which is in direct opposition to God’s natural order! This is why “so-called Christians” are said to be the greatest deterrent to globalism, and a unified world, with wickedness being equal to decency and righteousness. This is why the white male and his family unit (women and children) must be managed, put down and destroyed as a traditional force for “right and wrong” in today’s society. The easiest way to do this, is to label him as THE oppressor (by humanists) of “so-called minority groups,” and overrun his traditional culture with different people’s, rebel women, and children, to his complete overthrow, and so that putrid Pete the pervert & horrid Hellen the man hater, won’t feel bad for their deviant lifestyles. Soldiers in high heels draw online outburst. This is so very evident today, in something which was once dear to my heart, the U.S. Armed Forces. Barrack Hussein Obama and his fellow humanists, some of which have been placed on the Supreme Court, now have moved to completely gut this once masculine institution, by making it effeminate, and perverse in nature to its core; anyone opposed to this “change that humanists believe in” is now marked as an extremist, and possibly prosecuted. And this doesn’t seem to be stopping until it putrifies all its men, to conform to his demonic principles at work, by means of PC new world order type of indoctrination, challenging the very thought process (thought control) of the majority of the young men who serve. These abominations are strictly forbidden in the scriptures. See: 1 Cor 6:9, Deut 22:5, Lev 20:13, 1 Tim 1: 9-11, Rom 1:27, 1 Cor 6:9-10, Rom 1:26-27, Gen 19:1-38, 1 Tim 1:10, Heb 13:4, Eze 16:49, Rom 1:26, Lev 18:22, Col 3:5, Rom 2:1, John 15:22, 1Sam 16:7, Psalms 34: 1-22, Prov 31: 3, Luke 6:37, Mark 10:6-9, 1 Cor 8:9, 1 Cor 6:1-20, Matt 11:23-24, Lev 18:19-24, Luke 19:1, Luke 17:34, to name just some of the major Bible texts on effeminate behavior in defiance of God and his order. The bottom line is – one cannot equate evil with good, as it soils what is pure and good, and destroys the life of an organism, or organization. This is why the Lord God hates sin; and cannot accept it, as it destroys one’s spiritual life as well. You cannot mix the unrighteous with righteousness, (compromise) within the body of Christ, as this will destroy the sheep if not rooted out immediately. Jesus Christ is the gate (the entry point) to God the Father, for those whom the Father has chosen, and spiritually washed in his blood atonement. Human beings cannot change the nature of the sinner by way of preaching the Gospel, Bible teaching, or by law and behavioral modification. Wisdom shows that the only thing humanly possible to do, is to protect those who have been “given the chance” to enter into the Kingdom of heaven, which Jesus taught was within all “HIS” people, but must remain unspotted from the wicked, and false brethren, predominantly man orchestrated systematic theologies, the mother of harlots – church systems. Always remember that the scripture is addressing the spiritual condition of the bride of Christ, and no others. I have a concerned brother for me, he sent me the scriptural texts of 2 Timothy 2: 3 – 4 Thou, therefore, endure hardness, as a good soldier of Jesus Christ. No man who warreth entangles himself with the affairs of this life; that he may please him who hath chosen him to be a soldier. This is indeed what the disciple is supposed to be following, as this world is but a spiritual battleground, with Satan sifting the heart of the brethren. So one must be careful not to allow themselves to be overcome by the battle raging all around us, the soldier for Christ must remain focused on the Lord, day in and day out. The testing’s of our lives, demand that we as good officers, and ambassadors for Christ be less concerned for our own lives, and more concerned with learning how to follow our Lord and Savior, not just by example like false brethren do, but by turning our attention towards our heavenly Father, the author and finisher of our faith, and not our own understanding or strength. However, I believe we must engage with the world as lead by the Father should we wish to overcome our adversary, in what we have been given to accomplish for His name sake within our personal lives. I have been told while practicing my engineering too – focus, focus, focus, while using my hyperactive mind. Focusing has always been difficult for me, especially academically. So I thank God that his work of Salivation is a spiritual work, (which I have nothing to do with), except I remain focused on Him alone in my life, and simply follow my Lord’s leadings! False brethren cannot do this, as they have never seen him nor known him. And it doesn’t matter how much Bible credentials one may have. An Elder is a MAN who has grown in spiritual understanding, not just Bible academics in an attempt to follow sound doctrines. Being born with severe dyslexia, the Lord would not allow me to be accepted (until later) by institutionalized supposed centers of higher learning, predominately run today by humanists! However, by his grace, I learned one on one under a former Dean of a Bible College, holding a Doctorate of Divinity, Theology, and a Ph.D. in Pastoral Phycology for six years, while living in the City. You see, God’s hand is not shortened in enabling his people, but the world, on the other hand, most often runs contrary to the plan for the life of a disciple. This is why we cannot get entangled with the cares of the world, nor the world’s people – without the strict leading by the Holy Spirit in presenting the Gospel of Jesus Christ. Otherwise, our best of efforts are all but carnal in nature, and the Lord must work in between our ignorance of His leading, which I am very familiar with. Daniel’s Prophecies, in our time. Click on image to enlarge; it should open in another window, then click again for magnification. Where I am led to believe we are, as found and supported by the scriptural texts of the Bible. People have forgotten this is a spiritually discerned book, it is not meant to be studied as just another texts book; as it was written to the actual follower of “The Spirit of Truth” who is sent to give light to the actual brethren. The problem is, (as you will see in this graphic) most people are of the wrong spirit of error, which competes for the hearts of men. 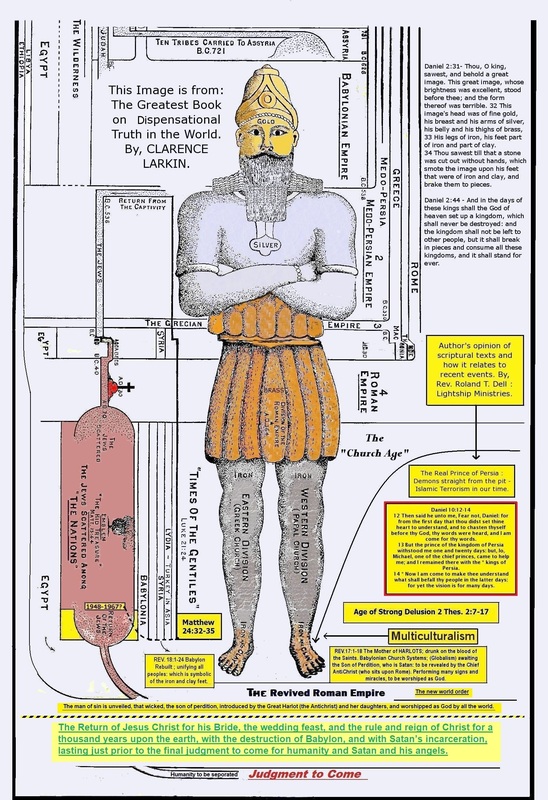 Daniel, Revelation and a couple other texts are used with Clarence Larkin’s drawing, in support of just where I think we are today in Bible Prophecy, and within the history of humanity. Isn’t it interesting how Satan takes the God-honoring nations of the world and accuses them of being evil? Case in point; the Islamic world calls the United States, “The Great Satan” whereas for over a hundred years the U.S., has been used of God to stop such Evil as the holocaust, and ethnic cleansings, even while helping to protect Muslim populations. I am not saying that the U.S., nor any other land region on earth, are God’s people today; only that the Accuser, The Father of Lies, The Man of Sin, That Wicket, is actively and continually attempting to tear down any trace, of Christian informed cultures. The Only place on earth that is physically important to God; is Jerusalem as HE has chosen to set his name there, and no other. For HIS NAME SAKE, he will not let Jerusalem be overcome, and by extension Israel. We who are found IN Christ; (the new covenant) today, are indeed Israel Spiritually to God, and no other found independent of the atonement are. This is NOT popular to point out, simply because it is the “offense of the Cross” which natural man hates, and wants no part of. Below is a link to “The real Prince of Persia” Published by THE CHRISTIAN POST, it but touches on what DANIEL 9-10 speaks about; but only on a “feel good surface level” for evangelism’s sake, in my opinion. 4 I prayed to ADONAI my God and made this confession: “Please, Adonai, great and fearsome God, who keeps his covenant and extends grace to those who love him and observe his mitzvot! 5We have sinned, done wrong, acted wickedly, rebelled and turned away from your mitzvot and rulings. 6 We have not listened to your servants the prophets, who spoke in your name to our kings, our leaders, our ancestors and to all the people of the land. 10 We didn’t listen to the voice of ADONAI our God, so that we could live by his laws, which he presented to us through his servants the prophets. 11 Yes, all Isra’el flouted your Torah and turned away, unwilling to listen to your voice. Therefore the curse and oath written in the Torah of Moshe the servant of God was poured out on us, because we sinned against him. 12 He carried out the threats he spoke against us and against our judges who judged us, by bringing upon us disaster so great that under all of heaven, nothing has been done like what has been done to Yerushalayim. 13 As written in the Torah of Moshe, this whole disaster came upon us. Yet we did not appease ADONAI our God by renouncing our wrongdoing and discerning your truth. 14 So ADONAI watched for the right moment to bring this disaster upon us, for ADONAI our God was just in everything he did, yet we didn’t listen when he spoke. 13 But the prince of the kingdom of Persia withstood me one and twenty days: but, lo, Michael, one of the chief princes, came to help me; and I remained there with the * kings of Persia. 14 * Now I am come to make thee understand what shall befall thy people in the latter days: for yet the vision is for many days.